For a couple of years my lady and I had been intending to check out the Eskdale Spur Track, a well known 4WD trail that runs from Lockharts Gap all the way, allegedly, to Mt Bogong. Looking at the topographic maps I noted that there are three SOTA Summits along the first part of that trail just to the south of Lockharts Gap, and so we decided that our next expedition would be along that trail. I intended to do a recce of the Summits and, if they were easy enough, to activate them. We were a little late getting on the road and turned on to the Eskdale Spur Track shortly after 1pm. A short distance up the first hill we found a perfect spot to stop for lunch, which we duly did. Having staved off the pangs of hunger we got back in the Hilux and continued with the GPS counting down the distance to the first of the three summits, Lockhart VK3/VE-135. I knew from the topographic map that the Summit was well back from the trail and a fair bit above it too, but the map shows a trail that turns off the Eskdale Spur Track and goes directly to the summit. Well, we drove way past that point and then turned around and drove carefully back again, watching for any sign of that side trail. We didn’t find it, nor any indication that it had ever been there. Perhaps it was a figment of somebody’s imagination! The walk up to the Summit looks do-able, with a gentle incline but plenty of undergrowth to push through and tumbled rocks and trees to scramble over. We decided to leave this one for next time. Resetting the GPS for the unnamed Summit VK3/VE-144 we continued along the Eskdale Spur Track. I knew this Summit had no trail leading to it and so we simply used the GPS to get us to the closest point of approach and then we got out and had a look-see. The slope leading up to the Summit looks very steep and as with the previous location there are plenty of obstacles to get past on the way up, and of course on the way back down as well. We concluded that the best route to this Summit would be to find our way onto the ridge line and walk up from there, but as time was getting on we decided to leave this one for next time too. 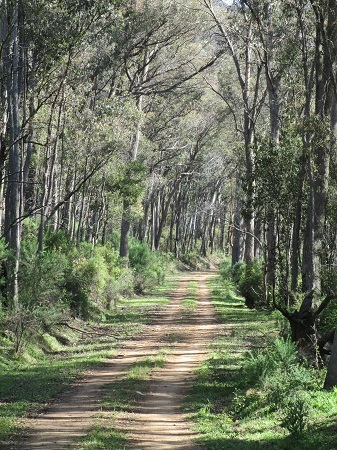 Continuing on, the Eskdale Spur Track takes a sharp right hand turn at the intersection of Steele’s Track. We had a close look at Steele’s as this is an alternative route in to Wild Horse Hill, and we were considering returning that way. More on that in a moment. Wild Horse Hill itself is not far from the intersection and the trail is close to the Summit, making this one a fairly easy activation. We left the Hilux and strolled up through sparse undergrowth to establish the portable shack in the shade of a large gum tree. When I switched on the FT817 I thought for a moment that it had gone deaf, or my antenna was faulty. The 7MHz band was quiet from end to end, as was 10MHz. On 14MHz there were a few weak and watery signals but nothing that sounded remotely workable. Bugger! I decided that since I was on the Summit I’d give it a go anyway and put out a few plaintive CQ calls. Eventually Ed, VK2JI, took pity on me and gave me a call. He was a strong signal with me, pushing S5 on the FT817’s meter, but he was having great difficulty hearing me. We persevered and made the contact, and Ed spotted me which soon brought VK2JNG/P, VK3CAT/M, VK3HRA/P and VK2DAG out of the noise for a completed Activation. Thank you Ed, I wouldn’t have done it without your help! Having bagged the required number of contacts we sat back and had a relaxing cup of tea, leaving the FT817 lurking on 7.090 just in case anyone else might pop up. 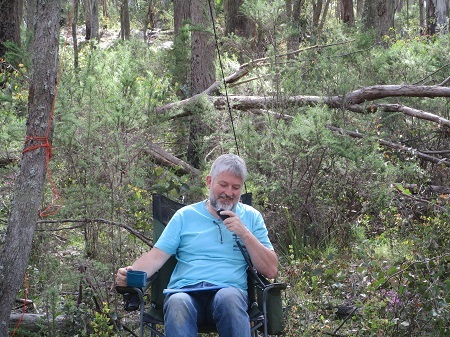 There was only Allen, VK3HRA/P calling CQ trying to complete his activation, and evidently finding it as hard going as I had done. My lady and I were both delighted when Allen did finally make it to the required 4 contacts. If you heard cheering in the distance, Allen, that was us! We decided to have a look at Steele’s Track and perhaps get back down that way. It’s very steep and quite narrow in places, with the 4WD getting a good brushing off as we pushed through the bushes. A kilometre or so down it becomes even steeper and as we weren’t sure what we were getting ourselves into we decided to turn round and go back via the Eskdale Spur Track to Lockharts Gap. Turning was, well, interesting but I did it and back we went. We may in the future check out Steele’s from the bottom, if we can find it. HF can be just as fickle as map makers.